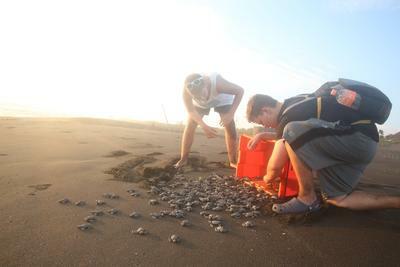 Volunteer on the Conservation 19+ Special in Mexico with Projects Abroad and help protect endangered sea turtles. Sea turtles are seriously threatened by poachers who take unhatched eggs. 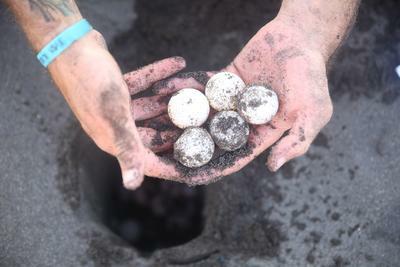 Our mission is to save as many sea turtle eggs as possible so that baby hatchlings can enter the ocean safely. You can help us achieve that. Every egg that we save, and with each new hatchling released into the ocean, we move one step closer to helping this precious endangered species thrive. You will have an important role to play in protecting and saving sea turtles. Our project is based at a turtle conservation centre near to a black sand beack. Releasing new-born turtles into the ocean once they have hatched. You will also assist with the daily care of turtles and iguanas living at the centre and cleaning their tanks and enclosures. As a variation from turtle conservation work, you will also get the opportunity to work at a local crocodile centre in the nearby town of Cofradia de Morelos once a week. Here you will clean and maintain enclosures by removing excess vegetation and painting, as well as record biometric data. There will also be an important research component of the work you will do as a volunteer on the Conservation 19+ Special Project in Mexico. You will collect data on turtles on the beach, and monitor the behaviour and diversity of the wildlife living around the local lagoon such as the abundant birdlife. The research you conduct will contribute to long-term conservation plans. Another way that you will be able to contribute to conservation efforts is by protecting the surrounding mangrove ecosystems. Mangroves are a vital for the rich biodiversity of ocean life in the area, as they are home to many animal species. By protecting the surrounding mangroves, you will help protect the coast from storm surges. At the Conservation Project in Mexico, you will stay near the beach in a shared Projects Abroad house equipped with basic facilities. In your free time after a busy day’s work you can socialize and relax with the other volunteers. You will also spend the weekend in Melaque, Jalisco, where you can sightsee and take some time to relax and enjoy the beautiful Mexican scenery. This project is available to ages 18-25.